Our product range includes a wide range of cebex 200 (0.255kg) grouting compound, conplast nc, conplast p211 concrete admixture, conplast sd110 concrete admixture, conplast sp430 dis concrete admixture and conplast wl concrete admixture. 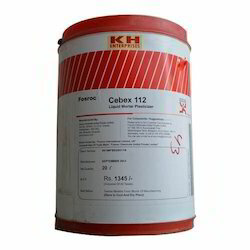 Uses Cebex 200 is an admixture for cement grouts where a reduced water / cement ratio and positive expansion are required. Applications include bed grouting, duct grouting, non-shrink infilling and jointing. Advantages Hydrogen free expansion system compensates for plastic shrinkage and settlement in properly designed cementitious grout. Reduced water / cement ratio in the grout mix ensures low permeability and long term durability in service. Gives high grout fluidity with low water / cement ratio, thus making placement or injection of the grout easy. No metallic iron content to corrode and cause staining or deterioration due to rust expansion in the grout. Composition allows high early strength development in grouts, without the use of chlorides. Chloride free accelerating, water reducing admixture Uses To accelerate the setting and early strength gain of Portland cement concrete and mortar mixes without the introduction of chloride. Acts as a plasticiser, so gives significant increases in both ultimate and early strengths. Typical applications include precast concrete, concrete placed in cold weather, concrete for repairs, mortars for brickwork. Advantages „ Chloride free, safe in prestressed and reinforced concrete „ Produces exceptionally high early strengths „ Plasticising action gives increased workability and / or increased strengths „ Early setting improves frost resistance „ Suitable for bricklaying mortar mixes „ Particularly effective in concrete at low temperatures Description Conplast NC is guaranteed completely free of all forms of chloride and is supplied as a light straw coloured liquid. The main active ingredient is an inorganic formate. Packaging Size 5 lt. , 20 lt, 200 lt.
Water reducing concrete admixture Uses „ To improve the effectiveness of the water content of a concrete mix. „ Higher dosages provide effective means of reducing concrete permeability and thereby reducing water penetration. Advantages „ Allows specified strength grades to be met at reduced cement content or increased work ability. „ Water reduction significantly improves compressive strengths at all ages and enhances durability through the production of low permeability concrete. „ Minimizes the risk of segregation and bleeding and assists in the production of a dense, close textured surface, improving durability. „ Chloride free, safe for use in prestressed and reinforced concrete. Standards compliance Conplast P211 conforms to IS:9103-1999. It also complies with IS : 2645 : 2003 as an integral waterproofing compound and ASTM C494 Type A as a normal water reducing admixture. Description Conplast P211 is a chloride free water reducing admixture based on selected sugar-reduced lignosulphonates. It is supplied as a brown solution which instantly disperses in water. Conplast P211 disperses the fine particles in the concrete mix, enabling the water content of the concrete to perform more effectively and improving the consistency of the concrete. This produces higher levels of workability for the same water content, allowing benefits such as water reduction and increased strengths to be taken. Technical support Fosroc provides a technical advisory service for on-site assistance and advice on admixture selection, evaluation trials and dispensing equipment. Technical data and guidance can be provided for admixtures and other products for use with fresh and hardened concrete. Typical dosage The optimum dosage of Conplast P211 to meet specific requirements should always be determined by trials using the materials and conditions that will be experienced in use. This allows the optimisation of admixture dosage and mix design and provides a complete assessment of the concrete mix. A starting point for such trials is to use a dosage within the normal typical range of 0.20 to 0.50 litres / 100kg of cementitious material, including PFA, GGBFS and microsilica. Use at other dosages Dosages outside the typical ranges quoted above may be used if necessary and suitable to meet particular mix requirements, provided that adequate supervision is available. Compliance with requirements must be assessed through trial mixes. 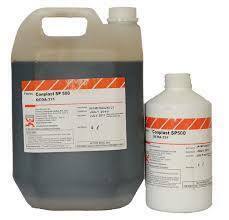 Contact Fosroc Technical Services Department for advice in these cases Properties Appearance : Brown liquid Specific gravity : 1.150 - 1.170 @250C Chloride content : Nil to IS:456 Air entertainment : Typically less than 1.5%. Additional air is entrained at normal dosages. Alkali content : Typically less than 5.0g Na2 O equivalent / litre of admixture. Application instructions Compatibility Conplast P211 is compatible with other Fosroc admixtures in the same concrete mix. All admixtures should be added to the concrete separately and must not be mixed together prior to addition. The performance of concrete containing more than one admixture should be assessed by the trial mix procedure recommended in this data sheet to ensure that, effects such as unwanted retardation do not occur. 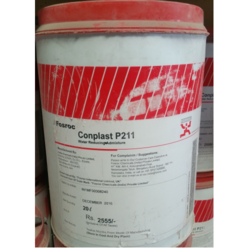 Conplast P211 is suitable for use with all types of ordinary Portland cements and cement replacement materials such. Uses Conplast SD110 is used to reduce material cost by reduction in cement without loss of strength or by increasing strength without additional cement. To get high early strength to improve upon productivity. Advantages „ Cement saving - strength, density and yield maintained with less cement. „ Increased strengths - higher strength without additional cement „ Reduction in breakages - reduced breakages through increased 'green strength'. „ Improved production - production cycle time can be reduced allowing more blocks to be produced in a given period. Description Conplast SD110 is a brown liquid which has been formulated for optimum performance as a cement saver under manufacturing conditions encountered in Concrete blocks. Improved formulation helps in both cement dispersion and compaction, maximising the strength obtained from the cement used. 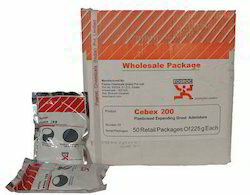 Packaging Size Packing Available In 20 lt./200 lt. Uses Conplast SP430(NE) is used where a high degree of workability and its retention are required, where delays in transportation or placing are likely or when high ambient temperatures cause rapid slump loss. It facilitate production of high quality concrete. Advantages „ Ready Mixed Concrete : Increased workability and workability retention minimise the risks of long distance deliveries „ Increased strength - Provides high early strength for precast concrete if water reduction is taken advantage of. „ Improved quality - Denser, close textured concrete with reduced porosity and hence more durable. „ Higher cohesion - Risk of segregation and bleeding minimised; thus aids pumping of concrete „ Chloride free - Safe in prestressed concrete and with sulphate resisting cements and marine aggregates. Standards Conplast SP430(NE) complies with IS:9103:1999 and BS:5075 Part 3 and ASTM-C-494 Type 'F' as a high range water reducing admixture and Type G at high dosage. Packaging Size Packing Available 125 ml/0.5 lt./1 lt./5 lt/10 lt./20 lt./200 lt. Uses To minimise permeability and increase the waterproofing properties of concrete and cement sand mortars for critical applications like roof slabs and screeds, basements, external plastering, bathroom floors, water tanks, sumps, drains etc. Advantages „ Liquid admixture: Instant and complete dispersion throughout the mix. Uniform waterproofing throughout concrete matrix. „ High efficiency: Dramatic reduction in permeability of concrete/ mortar „ Improved workability: Improves compaction of concrete and mortar, even where harsh sands or aggregates are used. „ Improved concrete quality : Minimises porosity and honey combing. Produces dense homogenous concrete. 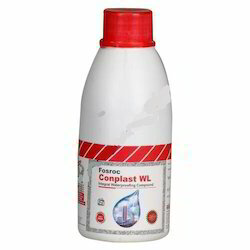 Standards compliance Conplast WL conforms to IS:2645-2003. Description Conplast WL is a dark brown liquid based on lignosulphonates which mixes readily with water and therefore disperses evenly. Conplast WL waterproofs by improving the quality of the concrete or mortar. It reduces the water demand for required workability and minimises segregation and bleeding. Thus it is more efficient compared to traditional powder waterproofers as its use results in two fold improvement of concrete or mortar. 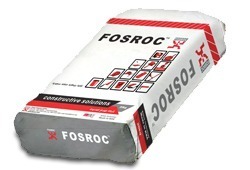 Uses To reduce permeability of concrete and sand/cement mortar for use in basements, roof slabs and screeds, water retaining structures, external plastering, bathrooms and balconies. High Quality - Traditional waterproofing material manufactured to latest standards. Workability - Improves workability Standards compliance Conplast WP90 powder conforms to IS:2645 - 2003 and is certified by the Bureau of Indian Standards. 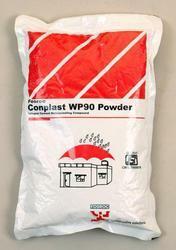 Description Conplast WP90 powder is a fine, white powder ready for use with concrete or cement mortar mixes. Conplast WP90 powder is a traditional admixture to fill natural pores within the concrete or mortar matrix to reduce porosity and improve water tightness. 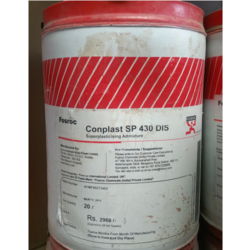 CONPLAST X421IC Packing In 1 lt./5 lt./20 lt./200 it. Uses To minimise permeability and increase the waterproofing properties of concrete and cement sand mortars for critical applications like roof slabs and screeds, basements, external plastering, bathroom floors, water tanks, sumps, drains etc. Advantages  Liquid admixture: Instant and complete dispersion throughout the mix. Uniform waterproofing throughout concrete matrix.  High efficiency: Dramatic reduction in permeability of concrete/ mortar  Improved workability: Improves compaction of concrete and mortar, even where harsh sands or aggregates are used.  Improved concrete quality : Minimises porosity and honey combing. Produces dense homogenous concrete. 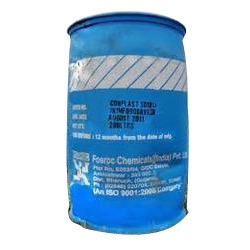 Standards compliance Conplast X421IC conforms to IS:2645-2003. Description Conplast X421IC is a dark brown liquid based on lignosulphonates which mixes readily with water and therefore disperses evenly. 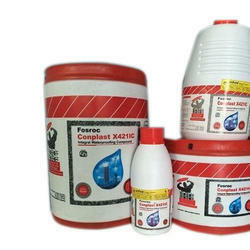 Conplast X421IC waterproofs by improving the quality of the concrete or mortar. It reduces the water demand for required workability and minimises segregation and bleeding. Thus it is more efficient compared to traditional powder waterproofers as its use results in two fold improvement of concrete or mortar. 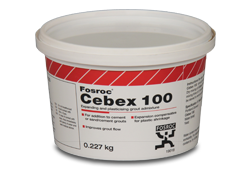 Expanding and plasticising grout admixture Uses Cebex 100 is an admixture for site batched cementitious grouts where a reduced water/cement ratio and positive expansion is required. Applications include bed grouting, duct grouting, non-shrink infilling and jointing. Composition allows high early strength development in grouts, without the use of chlorides. Standard compliance Cebex 100 is a suitable pre-stressing grout admixture when complying with BS 8110 Part 1, 1997, Annex A. Uses To improve workability and trowelling properties of sand/ cement mortar mixes during application. To increase quality of masonry and plastering. Advantages ,, Improved moisture retention and bond strength: Slows down drying out of mortar which remains workable longer. Ensures better bond to all surfaces, including ceiling. ,, Makes mortar crack resistant : Minimises drying shrinkage cracks and increases frost resistance in cold climates. ,, High workability : Even with harsh sands, makes creamy easy-to-apply mortar. ,, Cost saving : Increase yield of the same quantity of sand/ cement. Extra coverage normally exceeds material costs. ,, Better & safer masonry : Mortar fills joints easily and efficiently and ensures stronger construction. ,, Improved appearance : Mortar cuts cleanly from faces of brick, block or stone work. ,, Increased productivity : Speeds up work by easy application of mortar. Auramix 350 is a unique combination of new generation super plasticizer based on polycarboxilic ether polymer with long lateral chain. Electrostatic dispersion mechanism considerably reduces the water demand in fl owable concrete. It is supplied as a light brown liquid, instantly dispersible in water. Auramix 350 disperses the cement particles effectively in the concrete mix and hence exposes a larger surface area to the hydration process. This effect is used either to increase the strength or to produce high workability concrete or reduce cement content of concrete or to retard the setting time of concrete. Low viscosity admixture suitable for pumping different gradesof concrete to greater heights. Suitable for concrete having cement replacements and low water cement ratio. Provides higher strength without increase in cement content or reduction in workability. Ideal for precast concrete production. Reduce rate of workability loss normally associated with super plasticiser. Reduces shrinkage cracking because of lower water cement ratio. Makes the concrete water impermeable. Uses Suitable for high performance concrete To produce pumpable concrete To increase workability without extra water To improve cohesion, minimising segregation and give better finsih. Chloride free, safe for use in prestressed and reinforced concrete Can be used with concrete containing microsilica and other cement replacements. Advantages Improved workability - Easier, quicker placing and compaction. Increased strength - Provides high early strength if water reduction is taken advantage of. Increaseded quality - Denser, close textured concrete with reduced porosity and hence enhanced durability. Higher cohesion - Risk of segregation and bleeding minimised; thus aids pumping of concrete Standards compliance Conplast SP430G8 complies with IS91031999 and BS5075 Part 3 - 1985, and ASTM-C494M - 99a, 1999 Type 'G' as a high range water reducing admixture. Conplast SP500 is based on Sulphonated Napthalene Polymers and is supplied as a brown liquid instantly dispersible in water. Conplast SP500 has been specially formulated to give high water reductions up to 25% without loss of workability or to produce high quality concrete of reduced permeability. Increased strength - Provides high early strength for precast concrete if water reduction is taken advantage of. Higher cohesion - Risk of segregation and bleeding minimised; thus aids pumping of concrete.